Green tea powder made from the whole green tea leaf, ground into a fine powder that dissolves instantly in liquid. Perfect for hot or iced green tea, added to smoothies, great for baking too! Studies of green tea continue to find positive links to weight loss, blood glucose, immune strength, osteoporosis, skin cell and skin pigmentation and even bad breath. Green tea powder delivers more of green tea's benefits than tea bags or loose leaf. Makes hot or iced green tea instantly. Can be used in smoothies, cooking, baking. You've heard about the health benefits of green tea, loaded with antioxidants and metabolism-boosting catechins. But did you know that even with all the power of green tea in bag or loose leaf form, you're still only enjoying a fraction of this aromatic plant's true power? 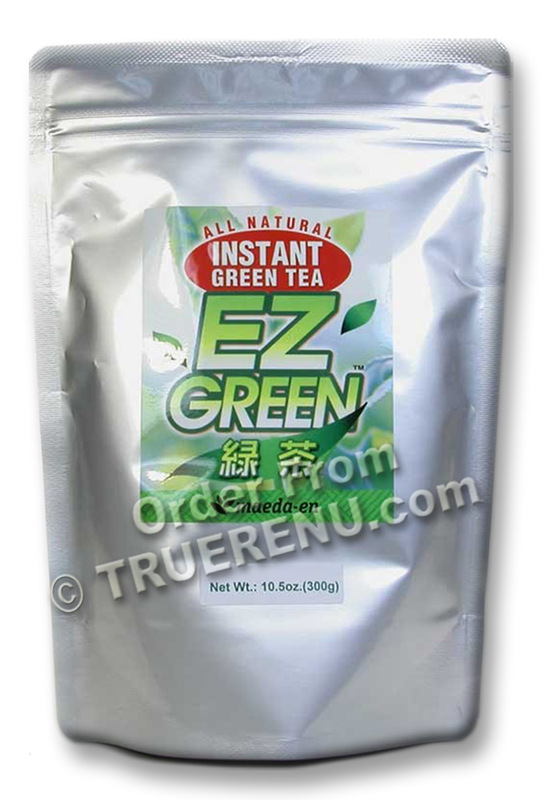 EZ GREEN is a fine powder of green tea leaves, which you dissolve directly into hot or cold liquid. By consuming the tea leaf itself, you're absorbing 10 times the nutrients of a tea bag or even loose leaf infusion. Fresh and aromatic, deeply flavored, and beautifully green - you control the intensity of flavor by the amount you use. A little goes a long way, too: 1 teaspoon of EZ GREEN makes about 4 or 5 cups of hot or iced green tea. other health benefits that green tea is known for! EZ GREEN powder gives you infinite new ways to get green tea into your diet, too! Scoop some into your daily smoothie. Add some foamy fat-free milk for a body-hugging green tea latte. Use it in cakes, cookies, sorbet, ice cream. Blend it with your favorite fruity vitamin water. We urge you to try EZ GREEN , and experiment with new ways to use it. And when you do, we'd love to hear from you! TrueRenu does the searching - and researching - for you. We look for hard to find, hard working products that do what they promise, and we bring them to you with detailed descriptions. Add 4-5 cups (1 cup = 8 fluid ounces) of hot or chilled filtered water to 1 tsp (approx. 3 gr) of EZ GREEN and stir well. Packaged in USA for Maeda-En. Ingredients: 100% Natural Green Tea, dietary fiber (maltodextrin). Product Size: 300 grams (about 10.5 oz) in resealable stand-up pouch. Makes 400-500 8oz cups of tea. You asked for it! We include one of these premium green tea bags with every order -- But now they are available in quantity for your enjoyment. Page displayed in: 0.1875 seconds.